Reliable perception of the environment is crucial for highly automated driving. In the European project, RobustSENSE, Fraunhofer FOKUS researchers and 14 partners, including Daimler AG and Robert Bosch GmbH, have developed a software platform over the past two years that combines various sensor data from cameras, lasers, radar and other information, for example from other cars. The aim is a robust and reliable perception of the road situation. At the final event of the project in Ulm today, the Fraunhofer researchers demonstrated that this is possible even in heavy snow and rain in a live transmission from their research vehicle on the test stand of the motor vehicle department at the Technical University of Berlin. The robust perception was once again put through its paces in recent months by researchers from the Smart Mobility business unit at Fraunhofer FOKUS in cooperation with the Automotive Department of the TU Berlin and the Daimler Center for Automotive IT Innovations (DCAITI). 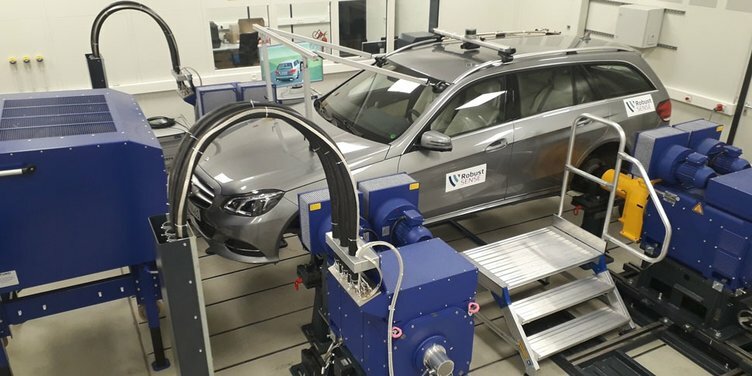 For this purpose, a research vehicle was integrated into a vehicle-in-the-loop test bench with the virtual simulation environment VSimRTI and the RobustSENSE algorithms. The advantage: The RobustSENSE algorithms could be tested in many weather and traffic situations independent of external conditions. Dr. Ilja Radusch, Director of the Smart Mobility business unit at Fraunhofer FOKUS sums up: "It is still very challenging for a computer to distinguish between an object and a person. In bad weather conditions, such as heavy snowfall, the sensor combination gives the vehicle a better perspective. RobustSENSE has shown how important virtual testing is. In the virtual tests, we were able to bring in various weather and road conditions in a controlled and repeatable manner using our intelligent algorithms. We have thus validated an important building block for automated and networked driving in the Digital Test Field Berlin". In order to robustly understand their environment, assistance systems and vehicles require highly accurate HD-Maps, but above all, optical sensor components, which are already being installed in various forms. Cameras support vehicles in maintaining their lane while driving on the highway. They register even small obstacles, and in highly automated vehicles, they initiate the braking process if required. However, especially the cameras are susceptible to faults in registering and recognizing of objects: strong backlight from the sun or harsh weather conditions like rain or snowfall can cause obstacles, other vehicles or persons may be recognized too late or not at all by the system. In order to overcome this, the researchers combine sensor data from a camera with positioning from laser and radar systems. Thereby, the researchers can ensure a robust and reliable awareness as well as driving maneuvers adaptable to all weather conditions. For the virtual testing, the simulation environment VSimRTI from Fraunhofer FOKUS was used. The system will now undergo field trials during autumn and winter in various European cities and highways amongst others in the center of Berlin. The project RobustSENSE concludes in May 2018, it is jointly funded by the European Union in the 7th Framework Program for Research and the Federal Ministry of Education and Research with 10.5 Million Euro. Further partners are Daimler AG, AVL GmbH, Robert Bosch GmbH, Centro Ricerche Fiat, Centro Tecnológico de Automoción de Galicia, European Center for Information and Communication Technologies – EICT, Ficomirrors S.A., FZI Forschungszentrum Informatik, Modulight, Inc., Oplatek Group Oy, SICK AG, Universität Ulm, VTT Technical Research Centre of Finland.